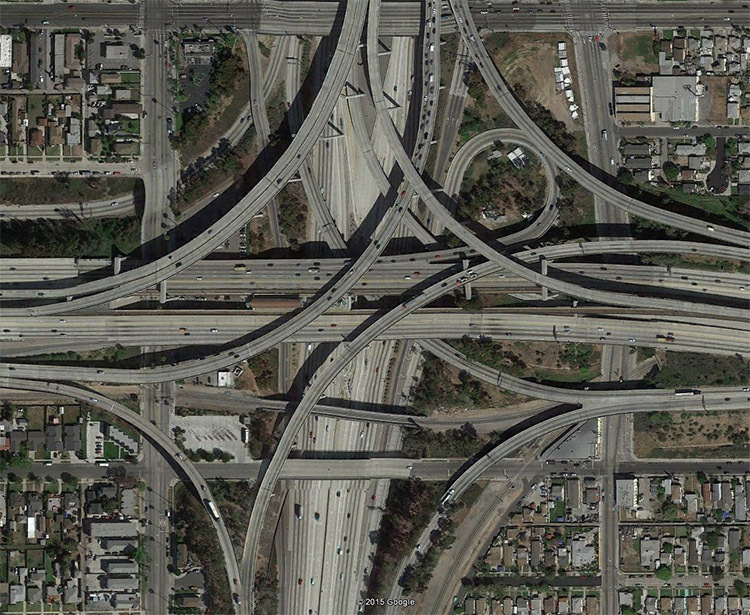 Salvador Dali would envy that, which is born in the minds of road engineers. Almost always we see only signsfrom the car window, bump stops and roadbed, but if you look at some road junctionsbird's-eye, then hair stand on end. Albeit virtually, a great satellite "Google" maps, which, as it’s known, knows everything, helped us to soar in the air. Arrival in Frankfurt, advised to sit at the portholes on the starboard side. There are more chances to see the "Frankfurt cross",Most loaded decoupling of Western Europe. 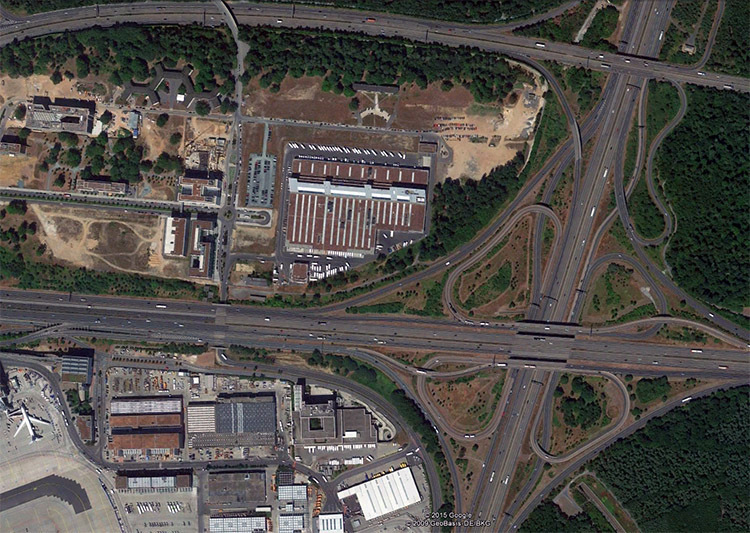 In the "cross" converge highways A3, A5, highway B43, and under a big of "clover" laid two railway tunnels. Build decoupling began in 1933, but because of the war ended only in 1957th. Now here passes 320,000 carsevery day. Decoupling was built in 1993 and named after Harry Predzherson – in honor of the famous and oldest federal judgein the United States, that including conducted the process of the junctionconstruction. Highways 105 and 110 are crossed at right angle here. almost all the way to Los Angeles, one goes from north to south, the other — from east to west,to the Pacific coast and the international airport of Los Angeles. For tens of kilometers around — checkrow suburbs of one-storey America. 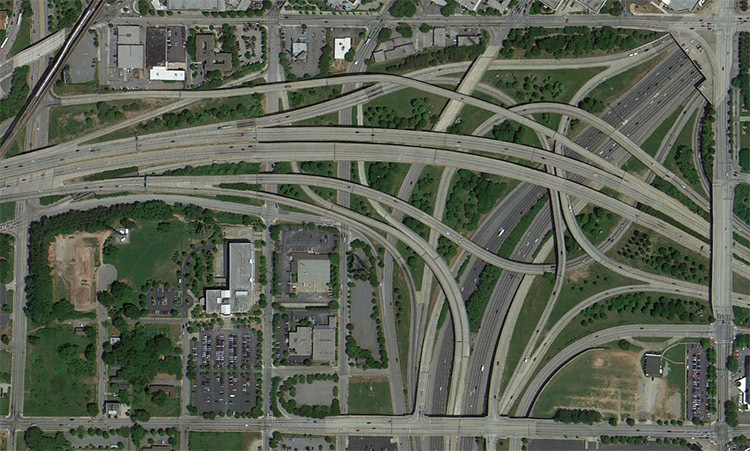 Just bumping to Atlanta, Highway 75 and 85 merge into a single fourteen lane road — Downtown Connector with daily traffic of more than 230-270 thousand cars. 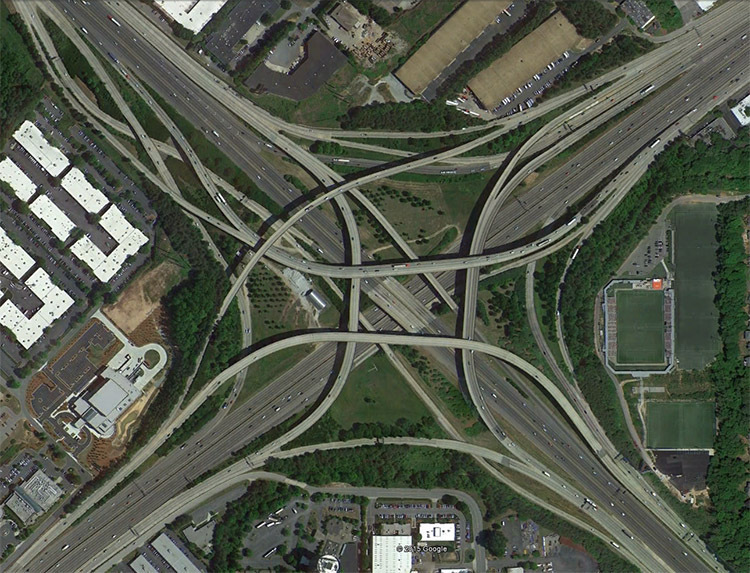 During its construction in the middle of XXcentury was razed to the ground a piece of the Atlanta historical center.And in the place where the connecting arterial road 20 crosses the highwayarose decoupling "Labyrinth. "We’d like renamed it in "Framed Labyrinth”: notice how it is inscribed in a rectangle of ordinary streets, typical for American cities. Two rivers merge in the suburbs of Gravelli Hill at Birmingham, diverge the two channels and the double track runs beside. 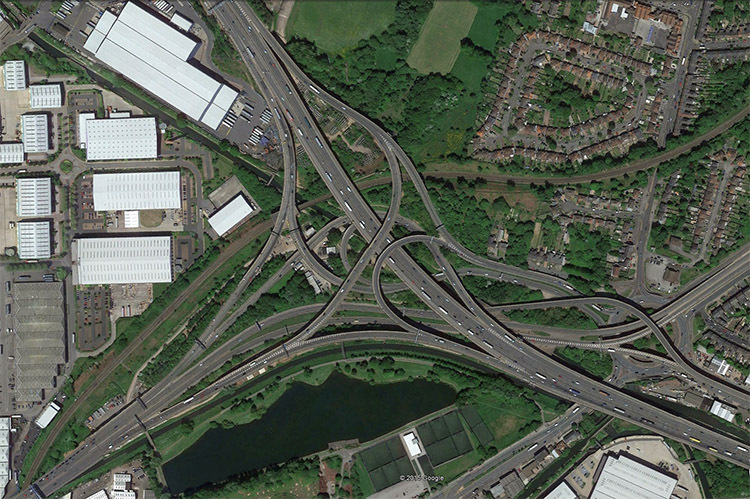 When engineers decided to connect here the M6 highway and A38 (M), Journalists dubbed the project "The spaghettijunction", because you purposely cannot image it. As long as you will understandsomeone where to go, you can move your mindor go away in eighteen directions, counting numerous localexits. Decoupling built in 1968-1972 years by installing 559 concrete supports, the highest of which reach 24.4 meters. Decoupling named Tom Moland named in honor of chief engineer of the local Department of Transportation.Built in 1983-1987, in twenty kilometers to the north-east of Atlanta at the crossing of the radialhighway 85 and the ring road 285 — analogue of the Moscow "Big concrete".Decoupling includes 14 bridges and overpasses, the tallest of which rises above the ground is 27 meters. Daily three hundred thousand cars passesfrom the decoupling. And more, some poor fellowsliveat the bottom. 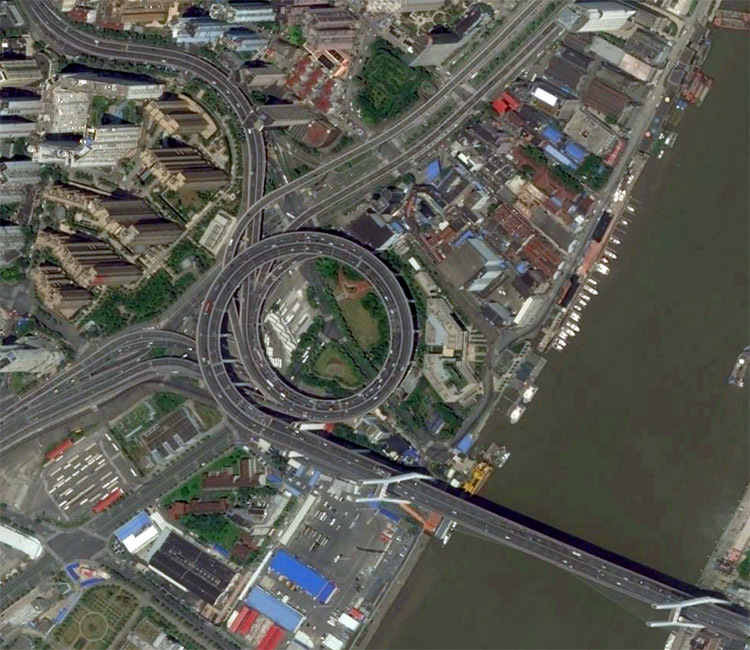 Huangpu River, which flows into the Yangtze River a few kilometers from the sea, not only divides Shanghai into two parts.In the city across the river spanned ten bridges, but 24 millionShanghai it is a little bit. Navigable bridge span can pass under a seagoing vessel height to 48 meters. City, born to be the capital, is being built in 1995 in twenty kilometers from Kuala Lumpur. As St. Petersburg the times of of Peter I, Putrajaya is specially designed to take away from disgruntled electorate and locate in the elite village all furs storage and government residences.The main difference from Peter and Putrajaya — there are almost not straight streets here, all the roads carefully repeated relief. 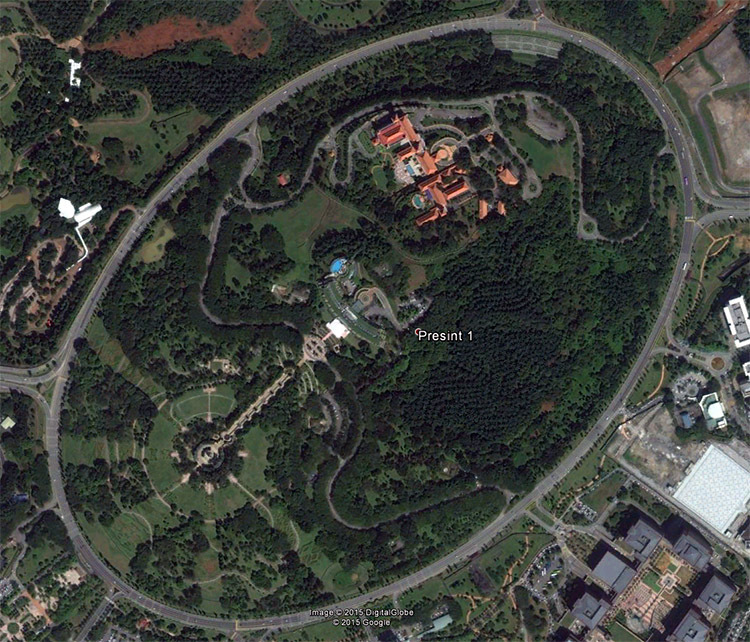 A few streets around the 50-meter hill form an oval (diameter 0,85-1,29 km), which is considered the world's largest roundabout take. 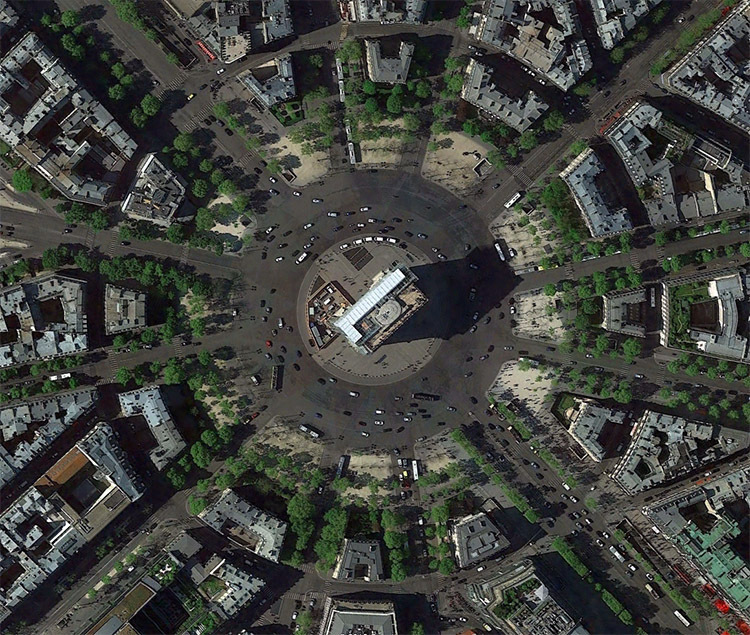 Place Charles de Gaulle before 1970 was more suitable to its name – Stars Place or Etoile. This place is known for the hikers as the area of the Arc de Triomphe, Paris drivers — as a place where the policenever comes, drivers-tourists — as a place where the navigator mocking tone commands: “Run the Ninth exit”. On the 40-meter carriageway was never markup and at rush hour this circle like an anthill, where all go on any trajectories.However, Paris is not Moscow, and if you are blunted and do not know where to turn off, no one except the Arabs, the Parisians, motorcyclists and bus drivers, will teach you of life. 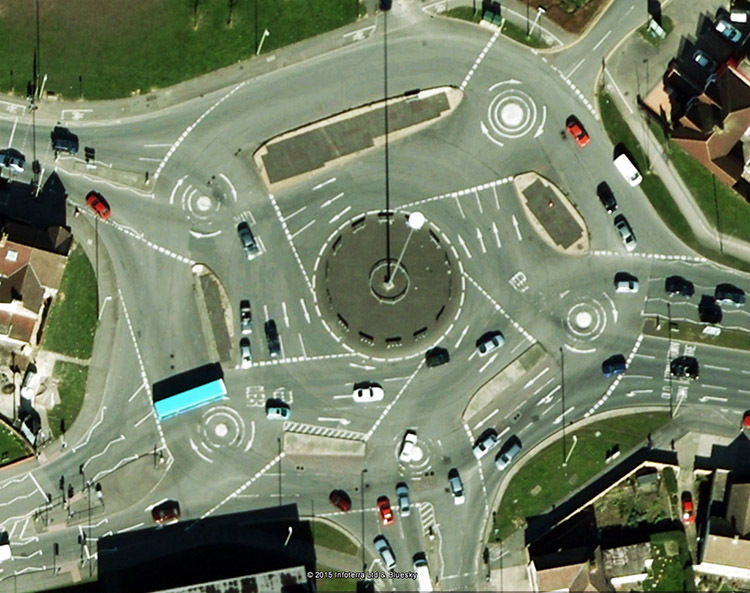 Fortunately, there are markings on the "magic circle" in Swindon, but even it is difficult to understand how to drive here because around one great circle arranged five small.Six small streets converge to the decouplingand the best option for the beginner — turn left at the approach.However, the British have become accustomed: in 1970 the scheme was popular in the UK andthey managed to build the same type of decoupling in several cities. There are also "light version", where small circles not five, but, for example, two. The coastline of Osaka — endless quay walls in the form of origami figures.Coastal areas are almost entirely bulk, on land reclaimed from the sea there is no extra space. 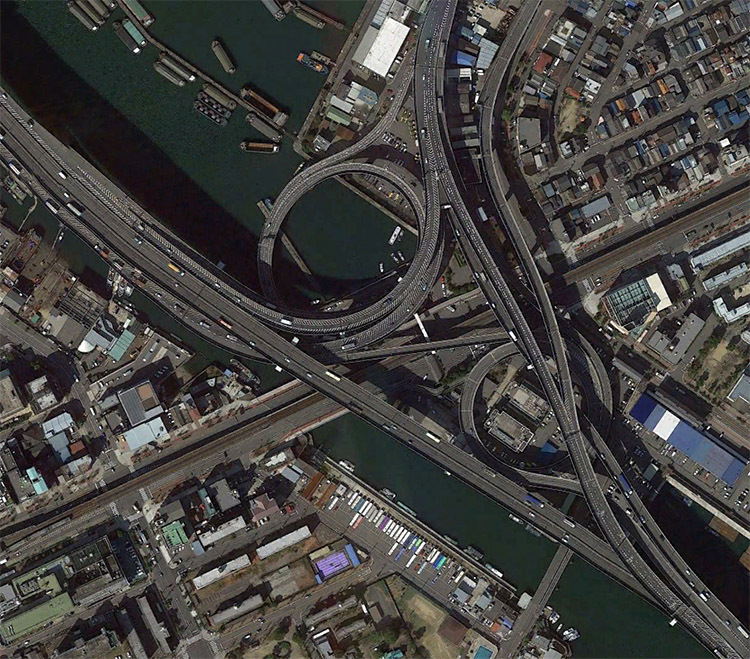 That’s why turnpike Bayshor laid the "second floor" of the port and residential quarters.And in order to the bridges over the harbor were sufficient height, the streets leading to the spiral road overpass. А чтобы мосты через гавани были достаточной высоты, с улиц на эстакады ведут спиральные дороги. Newark International Airport — the second of the two airports, which serving New York City and the surrounding area.It was opened already in 1928, but the traffic grew rapidly, as the motorization of the population in the state of New Jersey.In 1952 there was built a complex decoupling of five highways, which not only pass transit traffic, but also serve as an entrance to a giant airport. A small six-kilometer ring brings together nine highways and is called "Alphabet loop". 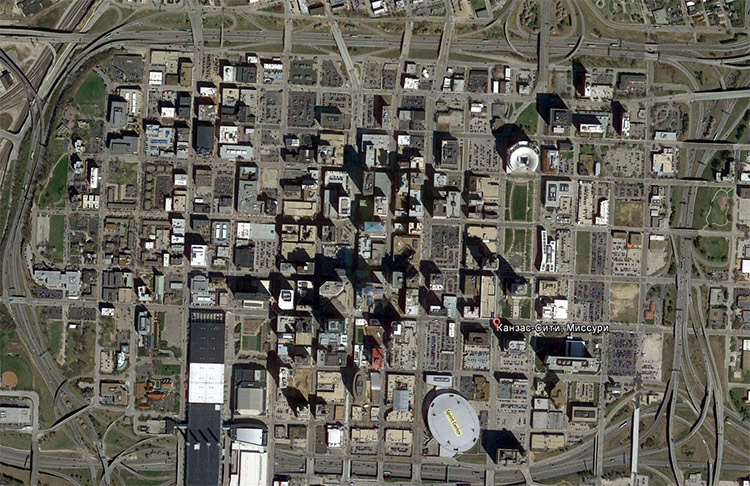 Inside — a business center of Kansas City and 23 Congress on both sides of the loop aresequentially numbered, starting with the 2A and ending 2Y.If the Americans build three more decoupling will complete the Latin alphabet.